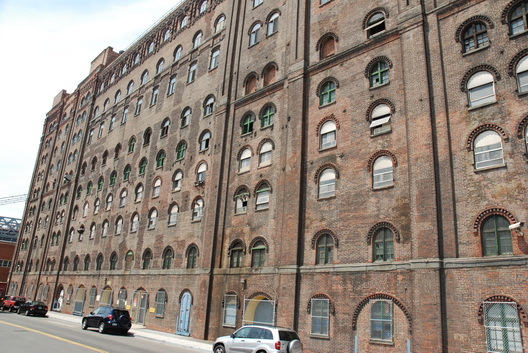 If you haven't already heard, let us be the second or third to tell you that several important buildings that were part of the old Domino Plant in Williamsburg were landmarked today. The vote by the Landmarks Preservation Commission was devoid of drama. The developers had even endorsed landmarking the main building (which for preservation purposes qualified as three structures). One of the most attractive buildings on the site, the Adant House, which runs along Kent Avenue next to the Williamsburg Bridge, was not up for consideration. It sits squarely in the path of a high rise tower. It's unclear whether preservationists will pursue landmarking of the Adant House, which is likely to encounter more serious opposition. More on the overall implications tomorrow. Wouldn't it be nice if it was still a working factory, that way people who just want to support their families could and wouldn't be forced out of the neighborhoods they lived in for ever? ..oh what's the frigging point? Why is landmarking so important if it's just being used as shell to house the rich? oh yeah , it looks a hell of alot better than the glass & metal CRAP that would replace it.